1) A10 Direct Cable (66268-03) – The A10 Direct Cable is a direct connect cable for Plantronics H-series headsets with quick disconnect to be used with phones with a dedicated headset jack (RJ9). Check you phones compatibility with the A10 cable on Headsets Directs website. 2) Quick Disconnect Cord (26716-01) – The Quick Disconnect Cord is a cable with a quick disconnect feature for all of Plantronics H-series headsets.This cable can be used with some Cisco phones with dedicated headset jack (RJ9). Also ships with M22 amplifier to be used with H-series headsets. 3) HL10 Handset LIfter –HL10 will automatically lift your handset for you for added freedom when using a Plantronics wireless headset. You can now answer/hang-up your calls remotely from anywhere within the range of your Plantronics wireless base. 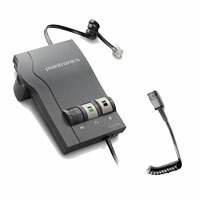 4) Plantronics Black Ear Cushions (15729-05) – The 15729-05 is a soft foam ear cushion for all day wearing comfort. This ear cushion is used on some of Plantronics H-series headsets and is sold 2 to a package. 5) M22 Vista Amplifier – The M22 is the latest Vista amplifier from Plantronics, with Wide Band technology and Clearline audio that will improve the quality of any call. Used with any Plantronics H-series headset which includes the quick disconnect feature. This unit will allow you to adjust your listing volume as well as your speaking volume. It also includes a mute button for your convenience.